After a fairytale morning watching the hot air balloons take off around us it was back to reality, breakfast, heat and hills! Exiting down through the pretty town of Ürgüp we made one last attempt to find white gas for our camping stove. Unable to find a traditional 1 litre bottle Jules found a guy selling Zippo lighter fluid (essentially the same stuff) and bought five 135ml cans to top us up and keep us off petrol for as long as possible! The hill up to Aķsalur is horribly steep, with a 3km section of 11% plus according to someone elses Strava segment! Luckily we found a shady picnic spot at the top where the local men were washing before entering the mosque for prayers. Before entering they showed us the local cherry tree and gestured for us to help ourselves. One even ran off and came back with a container full of white mulberries and hard green plums (a local favourite) which made a perfect finish to our lunch. We stayed high above Kayseri, a good thing too as from above it looks like a pretty big city with a lot of industry. Our more hilly but scenic route took us around the Erciyes Daği volcano with views of it’s snowy peaks for several days. 1) A bag of çay (tea) from a local. 2) An ice cold bottle of water from a dump truck who screeched to a holt going downhill when he saw us at a picnic stop above. 3) Cold drinks and ice cream from a local minimart. 4) An early supper of eggs, sucuk (local spicy beef sausage), cheese, honey, youghurt, olives, tomatoes & çay. 5) A late supper of soup and bread after asking if we could camp in an old school in Akçati. In a country dominated by men, it felt pretty special to be with these women, if only for half an hour. Our good fortune continued the following day. After cycling through fields of ripe barley on a bumpy gravel track we finally hit the tarmac and said ‘Merhaba’ (hello) to the local on the side of the road. ‘G’day’ came the response back!!! 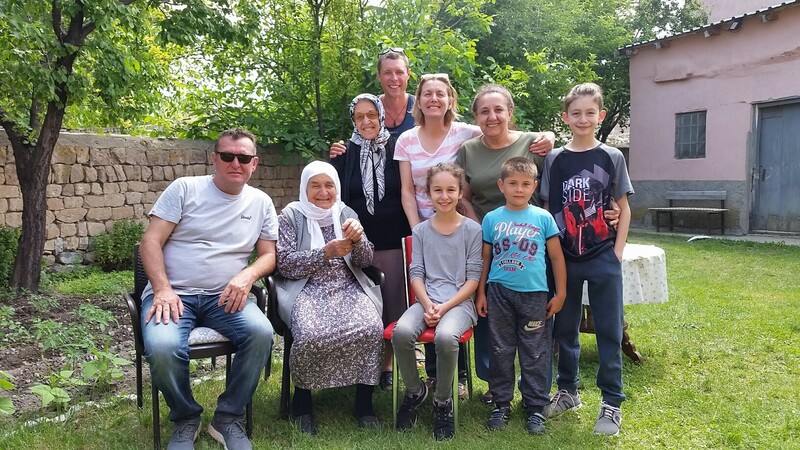 After a brief exchange we were invited back to his house for breakfast where we met his wife Nurhayat, their two kids, mum, aunties and cousins. Their family live in Sydney, Australia and were back home visiting family. It was such a treat to share another incredible Turkish meal with them and to chat in English about all sorts, especially as our usual trick of using Wikipedia to answer all our questions on local goings on had been limited since entering Turkey - it is banned there. Spot the Aussies! Clue, it’s not the blonde. A huge thanks to Nurhayat and her family for a wonderful morning spent with them. Every village in Turkey, however small or deserted, has a playground. This was one of the busier ones! Cycling further into the Central Anatolian plateau the landscape changed from lush green fields to a sparser but still green wide river valley. Farming moved from being predominantly arable to seeing hundreds of sheep and cows. We hadn’t hit a shop in a few days and stocked up after a big 90km day into Kangal. 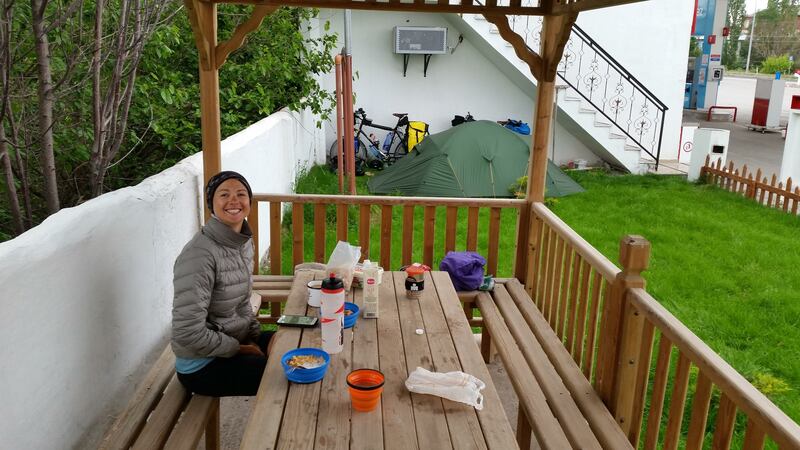 With limited accommodation options we asked at the local petrol station if there was anywhere we could camp nearby. ‘Petrol station dangerous’ was the first initial reponse, until a local came over to help and took us to the petrol station on the other side of the road. Here, there was a neat rectangular patch of grass, picnic tables and a drinking water tap. The owner came out, offered us tea and told us to make ourselves at home. 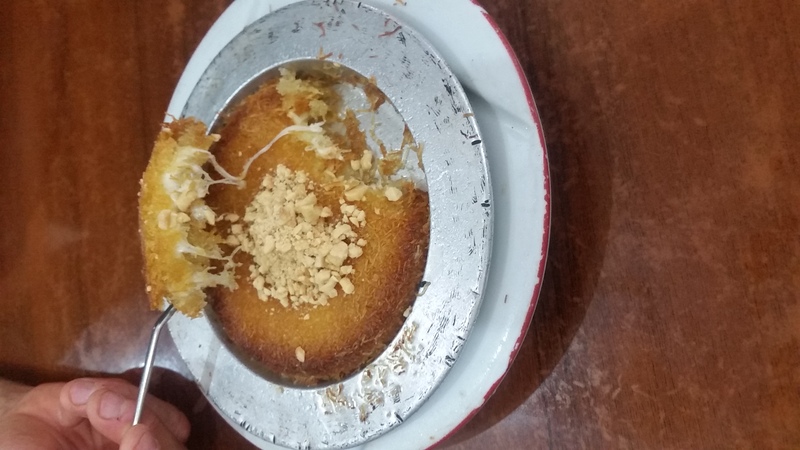 Even better there was a roadside restaurant opposite serving up a spicy ratatouille-like dish and künefe (a cheesy vermicelli pastry soaked in sweet syrup and topped with pistachio - zero guilt after a 90km day), so we didn’t even have to wash up! The petrol station shop and toilets stay open 24/7 so we felt safe, secure and had an incredibly rested night’s sleep, with the help of ear plugs of course. 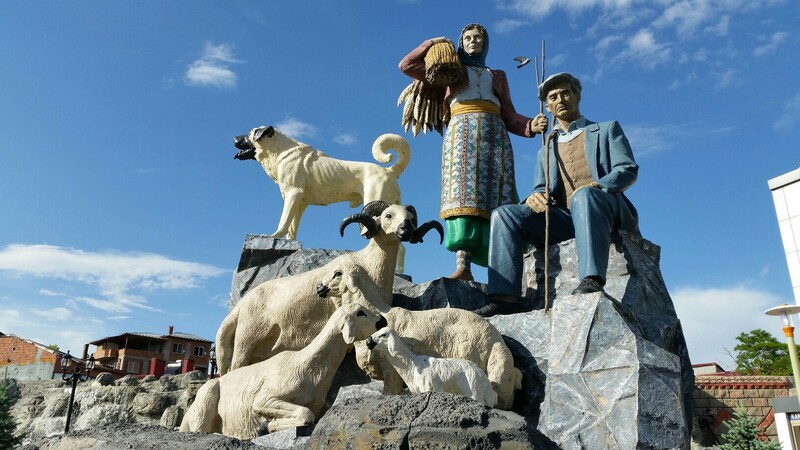 Predominantly a farming town, Kangal is famous for it’s huge farm dogs, cyclists beware when passing through this region! Enjoying breakfast at the petrol station! From Kangal we headed back into large, empty farmlands. We’d had a storm pretty much every evening in Turkey but could see the clouds looming by midday and so took shelter in an empty barn for lunch. The gravel tracks held up ok in the rain but not the earth ones. We could hardly push the bikes, let alone ride, and after a few minutes the wheels became clogged in thick red sludge. A Fiat Doblo passed not having any trouble at all, definitely the vehicle of choice around here. A man got out and seemed to ask us where the hell we thought we were going…fair question! 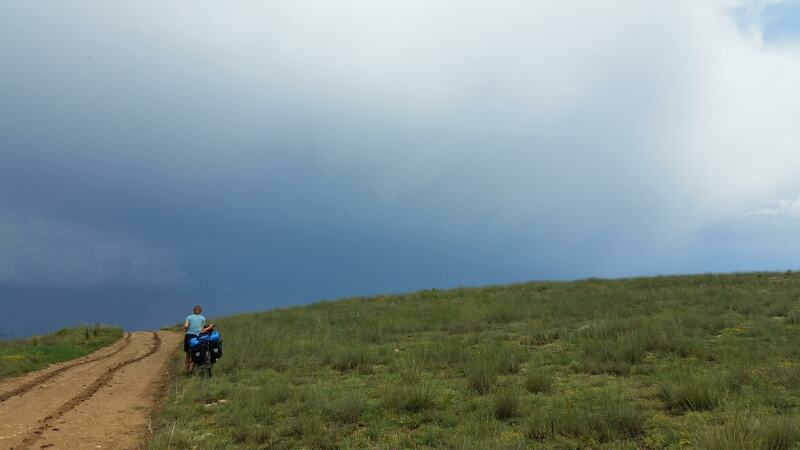 He told us the other path was shorter, and to come for çay at his. Exhausted we agreed and followed him down (off-route) into more mud…geez, is this a good idea?! As soon as we got to Ibrahim’s house he got the hose out and made sure all the mud was gone, just before the hailstorm. 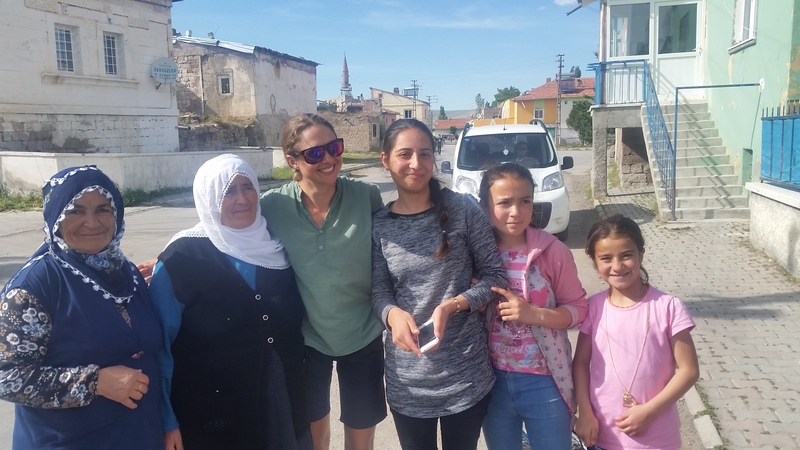 Bağdat, his wife, made supper and gestured that we should stay, and leave in the morning when the rain had cleared. Ibrahim very kindly then drove us past the rutted, still muddy roads to the asphalt. Neither spoke a word of English but welcomed us in like family, we are eternally greatful. Back to the mountains and towars Divrigi. The landscape changed dramatically again, it felt like we were riding into Mordor, past orange rocky gorges and dark grey tailings from the many iron ore mines surrounding this area. Then, all change again, through lush green valleys and soft sandstone hills where the water run-off makes them look like giant hands clutching onto the landscape. On recommendation we took a detour to Kemaliye via the Dark Canyon - an 8km section of road that has been cut through rock to get through the gorge and weaves in and out of tunnels. Usually a cyclists worst nightmare the Keymaliyeliler Taşyolu tunnels are an incredible adventure. It’s just you, the swallows and the Euphrates river below. Good lights and tyre tread are needed!! Kemaliye is a true mountainside town and we’d love to return to do some hikes in the area. Past more mines and quarries to Illiç where a new dam put us off the map and in the lake! The new road is very good though, in part due to the money from the dam and in part due to the Iliç gold mine - currently Europe’s largest gold producer. From here there’s only one road to Erzincan - the Kemah Kuruçay Yolu road - possibly my favourite on tour so far. You ride gently up the valley before climbing a few switchbacks and ending up on the most incredible belvedere road looking across a steep valley gorge to the mountains beyond. 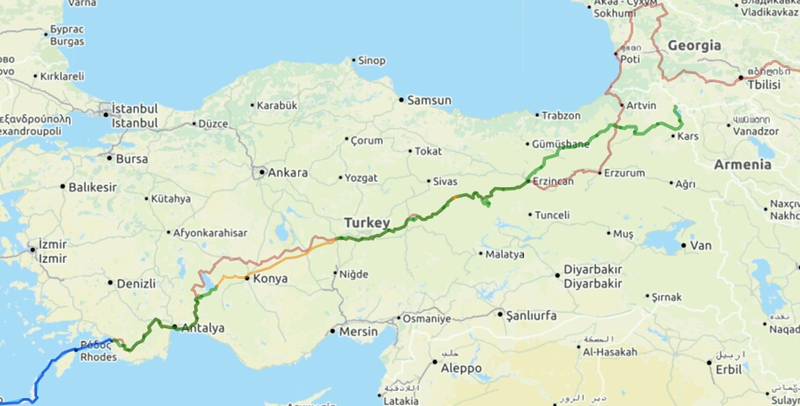 In Erzinçan we avoided joining the D100 motorway by taking a farm track which led nicely towards Ibrahim’s house, our Warmshowers host for a few nights. Erzincan was a good place to rest and stock up. We also had our first doner in Turkey, complete with ayran and kunefe for desert. First, but defintely not our last! 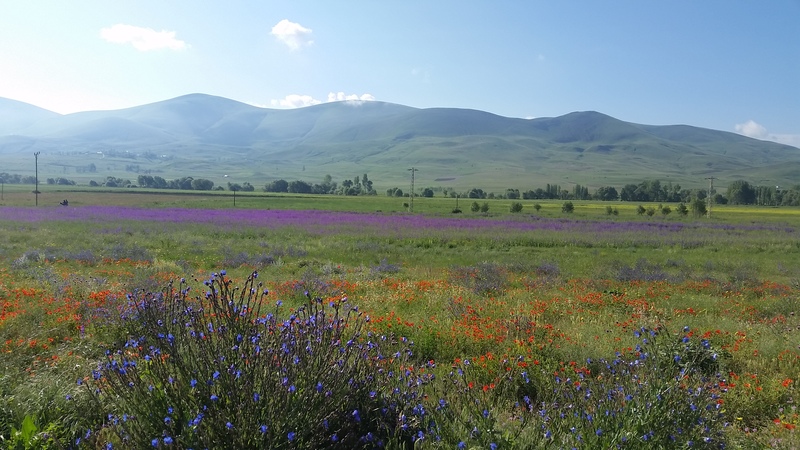 The farms leave strips of wildflowers between crops. A beautiful sight and a haven for bees.